Think Eggnog! That’s what I think of when I enjoy this luscious vanilla-nutmeg rendition of french toast! 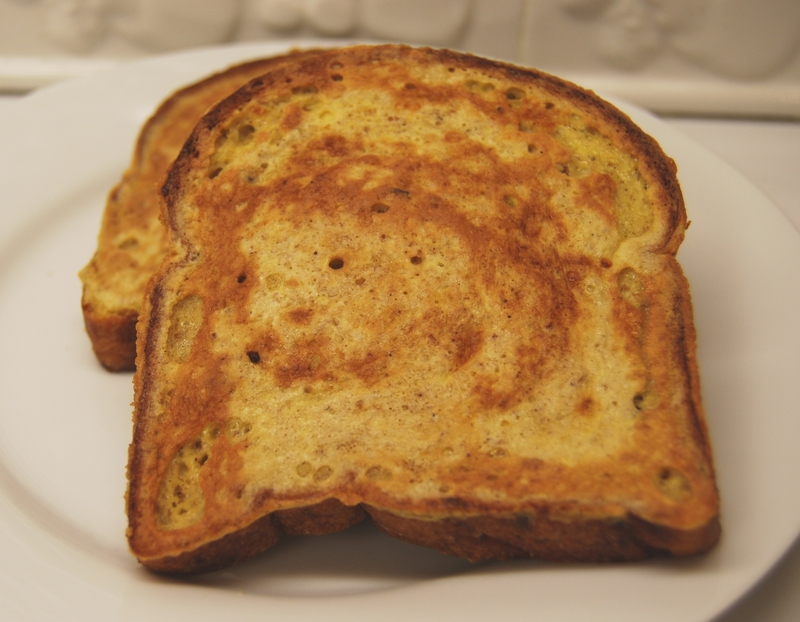 I have been making French Toast for many years and it was just a couple of weeks ago that I had the idea (and I am sure it’s not an original) to add nutmeg to the egg mixture. Order the Health Express High Protein Multigrain Bread if you want your breakfast low carb. I also enjoy their other breads which would work well in this recipe. If you like a firmer bread, use the Health Express All Natural Low Carb Sesame SMALL LOAF . Or, try a variety by ordering their Sample Pack which includes Sesame, Oat Bran, Flax and Cinnamon Raisin! GET 10% OFF YOUR ENTIRE FIRST ORDER of bread and all other products sold by LowCarb-R-Us.com! Simply add “CLL” (a Carb Light Living™ exclusive offer) in the coupon code box at check out. NO EXPIRATION DATE! See ordering details below. Dip, double dip, and triple dip if you like, all the bread slices. Coat both sides. Transfer bread slices to griddle or skillet, heating slowly until bottom is golden brown. Turn and brown the other side. Serve the French Toast hot with butter and syrup (neither calculated in recipe). I found Vermont Sugar Free Low Calorie Syrup to be the lowest in carbs. You can find it in the CarbLightLiving™ Store: http://astore.amazon.com/carblightlivi-20 . Note that just 1/4 cup of this low carb syrup is 5 carbs, so use sparingly! If you don’t care about syrup, skip it! For a unique low-carb topping, mix 1 Tablespoon of sugar-free jam with 1 and ½ Tablespoons of water and microwave for 30 seconds. 3. Select the item(s) sold by LowCarb-R-Us.com – you get 10% off everything! 3. Put in discount code “CLL” and you will see the 10% deducted from the total.